I invent games. It’s no great talent. Anyone can do it, but most people don’t. Most people are content to play the games that others make. Me, on the other hand, I see possibilities for games everywhere–I can make them out of anything, or nothing. I want to share with you all a little game that I made a few months ago while I was waiting for my son to get back in street clothes and come out and join me after his performance in Agatha Christie’s And Then There Were None. I had a couple of 20-sided dice in my pocket–yes, I usually do walk around with dice in my pocket–so I invented a simple game of who can roll the highest number. Such dice games go way back to the beginning of time. The Romans used 3 6-sided dice with pips on them the same way we do today, and it was simply who rolls the highest number. Three sixes was called the Venus throw, and it won automatically. I wonder if 3 ones were called the Inferno throw. So here are the rules for Double Dodecahedron–my gift to everyone who simply likes to roll dice. Play it and improve your skills in addition and calculation. 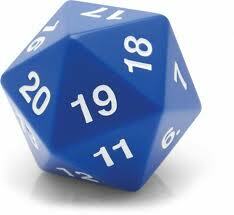 Equipment needed: 2 20-sided dice numbered 1 to 20. Your brains and memory. Object of the game: Roll the highest total to win. Rules: Roll 2 20-sided dice and total them. Example one die rolls a 17, the other a 4, the total is 21. If the player rolls the same number on both dice or consecutive numbers on both dice, he totals them and rolls again. 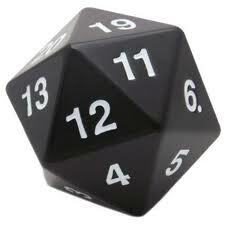 Example: I roll a 16 on one die and a 17 on the other. The total is 33. Then I roll the dice again and get a 2 on one die and a 2 on the other for a total of 4. 33 + 4 = 37. Then I roll them again. This time I get a 5 on one die and a 20 on the other for a total of 25. 37 + 25 = 62. That is a very good roll and probably wins the game for me. Each player has 3 chances to beat the previous high total. Using the example above let us say the first player was my son Corencio, and I was the second player. He rolled a 21. Then he gave the dice to me. I got really lucky and rolled a 62. Then I hand the dice to you. On the first roll you got a 3 and an 18–fails. On the second roll you got a 14 and a 16–total is 30–a good roll, but still it doesn’t beat my 62. On the third roll you roll 20 and 20 for a total of 40 and then you roll 20 and 7 for another 27. 40 + 27 = 67. You are winning. Then Corencio has another 3 chances to beat you. And I get 3 more chances. Let us say that neither of us can beat a 67. You win! Simple, right? But surprisingly fun. This game depends on pure luck, but some people seem to win more often than others. Is it a flick of the wrist when rolling the dice? Subtle telekinesis in controlling which faces come up? Or just pure luck? I believe in Luck. One of the rules I live by is that IT IS BETTER TO BE LUCKY THAN GOOD. Of course, if you are both lucky and good (like I am–grin) that is better still. Double Dodecahedrons can easily be turned into a gambling game. You could bet a fixed amount of money on each round of play. Let’s say you have 3 players and each puts $1.00 in the pot. The winner makes a net profit of $2 on the round. Or, let’s say you have the old coin jar handy. Each player contributes a penny for each point on the dice. If you roll the dice and get a 3 and a 5, you would put 8 cents in the pot. The next person would roll and get perhaps a 20 and a 15 and put 35 cents in the pot. A third person rolls a 17 and a 2 on the first try and puts 19 cents in the pot–that doesn’t win. He can roll again. Let’s say he rolls a second time and gets 7 and an 8. 15 doesn’t win, but it does get to add and roll again. He puts 15 cents in the pot. Then he rolls a 20 and a 4. He puts 24 cents in the pot and his total is 39. That is high enough to take the lead so he passes the dice. Using just a penny a point and several players, this game could get very exciting very quickly. So, put some 20-siders in your pocket, gamers. I know you own the dice. And next time you have some time to kill, get them out and play Double Dodecahedrons. It’s fun, and the time goes by very quickly when you’re gaming and having fun. If you ever play dice games, or make games up on the spot, leave a comment, ok?